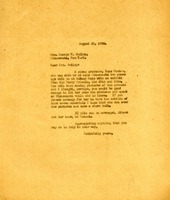 Letter to Mrs. George H. Smiley from Martha Berry informing her that a young graduate of the Berry Schools, Inez Wooten, will be at Mohonk Lake and Miss Berry asks Mrs. Smiley if it might be possible for her to arrange for Miss Wooten to speak at Lake Minnewaska while she is there. Miss Berry also asks if Miss Wooten might show the moving pictures of the schools. Miss Berry asks her to inform Miss Wooten whether it would be possible for her to speak. She also thanks her for anything that she might be able to do to help. 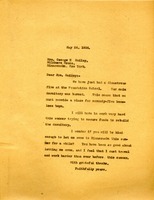 Letter to Mrs. George H. Smiley from Martha Berry informing Mrs. Smiley that The Foundation School has suffered a devastating fire that burned a dormitory that housed 75 boys. Miss Berry states that she has to work hard to raise the money to rebuild the dormitory during that summer in order to have housing for the 75 homeless boys. She asks Mrs. Smiley is she might come to Minnewaska in order to work and raise money. She says Mrs. Smiley has always been good about letting her come.